It was my first time to visit Keels and Wheels. 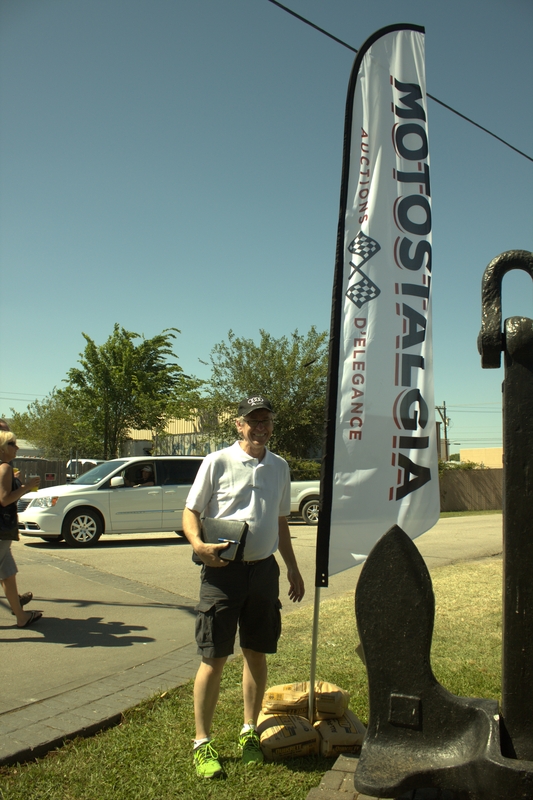 I’ve been to many car auctions and many car shows, but this is the first boat and car show combined; it was fantastic. Even if you are not a boater, you can appreciate the work and care put into these beautiful floating machines. Most of them were wooden Chris Crafts from decades and centuries gone by. I was only able to make it to Seabrook for Saturday Concours d’Elegance and did not attend the auction or awards, so I’ll need to catch up on those after the fact. 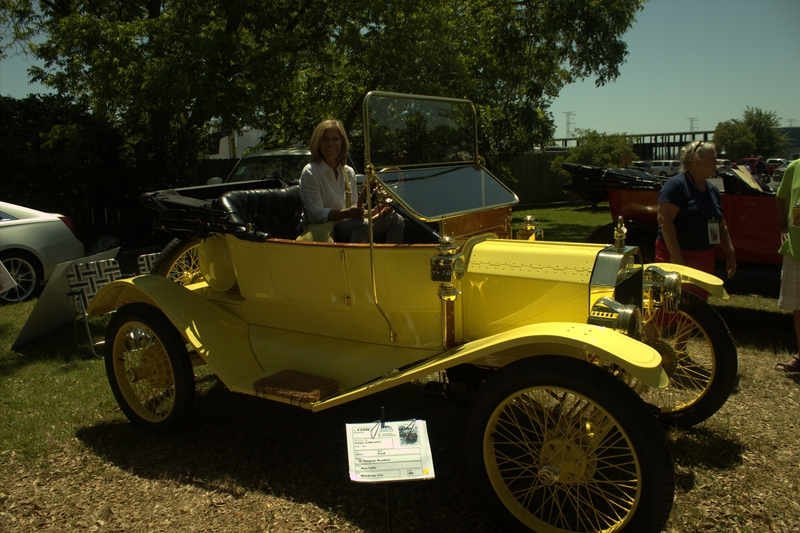 There was a great collection of automobiles from the early 1900’s through today. From the entry gate around the first corner they are mostly American brass cars, beautifully restored, many for much more than their value. I started out talking to Don Sable who had almost 5 years into the restoration of his 1911 Ford Model T Torpedo Roadster. The picture below is my wife sitting in his car. they were magnificently restored and then a lineup of Ferrari’s down by the docks. 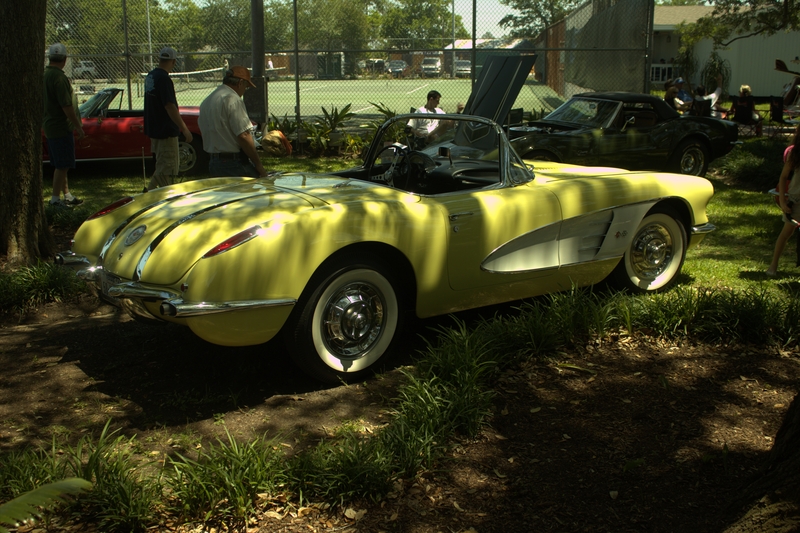 There were some beautiful 430’s, one Dino that was a little rough on the outside, but presentable. 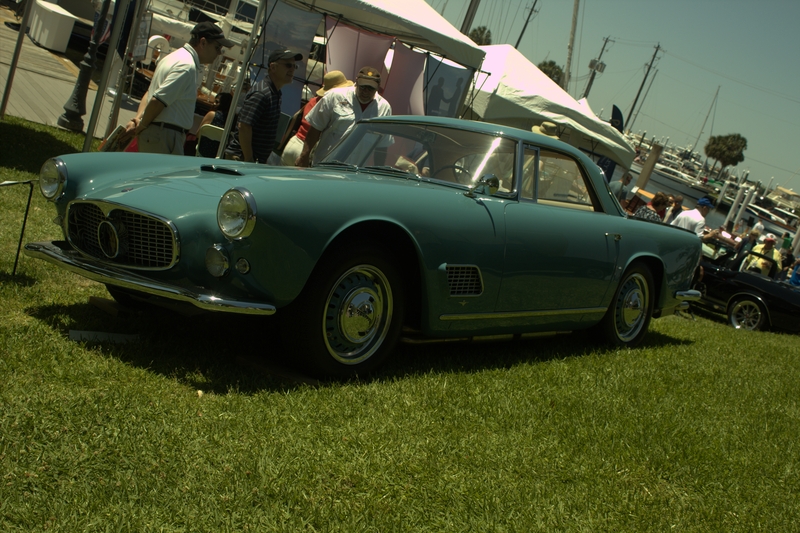 Though I had many favorites for the day, the one that I spent the most time with was a blue 1959 Maserati 3500 GT. The owner wasn’t around, so I didn’t get any background on the car’s history. Enjoy the pictures from the show and I’ll post some specifics about a few talks with some owners I had in a day or so. You’ll find certainly a whole lot of details like that to take into consideration. Which is an awesome point to bring up. I offer you the thoughts above as general inspiration but clearly there are questions like the one you bring up where the most critical thing will likely be working in honest good faith. I don?t know if best practices have emerged about items like that, but I am positive that your job is clearly identified as a fair game. Each boys and girls feel the impact of just a moment’s pleasure, for the rest of their lives. fantastic submit, very informative. I ponder why the opposite experts of this sector don’t notice this. You should proceed your writing. I am confident, you’ve a great readers’ base already! Hiya, I’m really glad I’ve found this information. Nowadays bloggers publish just about gossips and web and this is actually annoying. A good blog with exciting content, that’s what I need. Thank you for keeping this web site, I’ll be visiting it. Do you do newsletters? Can’t find it. Howdy would you mind sharing which blog platform you’re using? I’m looking to start my own blog soon but I’m having a difficult time making a decision to go with BlogEngine. Can I just say what a relief to locate someone who really knows what theyre talking about online. You unquestionably know the best way to bring an problem to light and make it important. Much more men and women must read this and realize this side of the story. I cant believe youre not far more well-liked mainly because you undoubtedly have the gift. F*ckin’ awesome things here. I’m very satisfied to look your article. Thanks a lot and i’m having a look ahead to touch you. Will you kindly drop me a e-mail? Aw, this was a seriously nice post. In idea I would like to put in writing like this furthermore – taking time and actual effort to make a very superior article… but what can I say… I procrastinate alot and by no means seem to get something completed. Hi! I just would like to give a huge thumbs up for the terrific info you’ve got here on this post. I will probably be coming back to your weblog for more soon. What’s up, I check your blogs regularly. Your writing style is awesome, keep doing what you’re doing! for those of us just getting started out, is there any chance of getting some from the letters mailed in the past? Stephen, I got the first letter and every an individual after EXCEPT Margaret Cho’s. Can you remedy that, please? Truly insightful bless you, I am sure your current visitors could quite possibly want even more posts of the naturel maintain the excellent function. This can be surprisingly legal place as greater contained in the wordpress blog. Take pleasure in dealing with roughly. This can be highly real issue as improved throughout the web-site. Take pleasure in speaking of all over. The impacts from these micro beads are immense, and must be stopped! Removing the beads by 2015 is a fair and reasonable target. We can’t afford another two years of unnecessary destruction! You can find which the coupon codes currently you provides the greatest special discounts when compared with another token site. It is perfect time to make some plans for the future and it is time to be happy. I’ve read this post and if I could I wish to suggest you few interesting things or advice. Maybe you can write next articles referring to this article. I desire to read even more things about it! Great amazing issues here. I¡¦m very satisfied to see your article. Thanks a lot and i’m taking a look forward to touch you. Will you kindly drop me a mail? I simply had to appreciate you again. I am not sure the things that I would’ve sorted out in the absence of the type of solutions shared by you over that topic. It was actually a frustrating matter in my view, but viewing your professional strategy you treated that took me to weep for joy. Now i am happy for this service and thus hope you are aware of a great job you happen to be doing training the rest with the aid of your blog post. I am sure you haven’t come across all of us. I and also my guys appeared to be examining the excellent tips located on the blog then the sudden came up with an awful suspicion I had not expressed respect to the web blog owner for them. All the guys were definitely absolutely thrilled to read them and have seriously been using these things. We appreciate you simply being simply thoughtful and then for considering certain fabulous useful guides millions of individuals are really needing to understand about. My honest regret for not expressing gratitude to earlier. you are in reality a excellent webmaster. The web site loading velocity is incredible. It seems that you’re doing any distinctive trick. Moreover, The contents are masterpiece. you’ve done a excellent task in this subject! Thank you for the insight, sharing this creates public awareness and we are a ll grateful for this. Thank you so much for providing individuals with an extremely brilliant possiblity to check tips from this website. It’s always very kind plus jam-packed with a great time for me and my office co-workers to visit the blog at a minimum three times weekly to read the fresh things you have got. And indeed, I am also usually fulfilled with all the beautiful tricks you serve. Some 3 ideas on this page are definitely the best we have had. You’re the one with the brains here. I’m watnihcg for your posts. I definitely wanted to develop a small comment in order to appreciate you for the precious tactics you are placing at this site. My incredibly long internet lookup has at the end been paid with good insight to share with my company. I would admit that most of us visitors actually are very endowed to be in a superb site with so many marvellous individuals with very helpful things. I feel pretty grateful to have seen your site and look forward to really more excellent times reading here. Thanks once more for all the details. I simply needed to thank you so much once again. I am not sure the things I could possibly have created without these solutions shown by you regarding that subject matter. It was the frustrating difficulty for me personally, however , looking at a expert fashion you handled it took me to jump for joy. Now i’m thankful for the work and in addition believe you comprehend what a powerful job you’re carrying out training men and women through the use of a web site. I’m certain you haven’t encountered all of us. whoah this weblog is fantastic i really like reading your posts. Keep up the great work! You know, many persons are looking around for this info, you could aid them greatly. This Keels and Wheels, May 2014 | CarReads.com will help the internet viewers for setting up new website or even a blog from start to end. Hahahahahahaha, this politics related YouTube video is really so funny, I loved it. Thanks in favor of sharing this Keels and Wheels, May 2014 | CarReads.com . I do consider all the ideas you’ve presented on your post. They are very convincing and will definitely work. Nonetheless, the posts are too brief for novices. Could you please extend them a little from subsequent time? Thank you for the post. The new Zune browser is surprisingly good, however, not as good as the iPod’s. It works well, but is not as fast as Safari, and possesses a clunkier interface. If you occasionally thinking about using the internet browser that’s not a worry, however, if you’re planning to look at web alot from a PMP next the iPod’s larger screen and much better browser might be important. Remarkable YouTube movies posted at this web site, I am going to subscribe for regularly updates, because I don’t wish for to miss this series Keels and Wheels, May 2014 | CarReads.com . Between me and my better half we’ve owned more MP3 players through the years than I can count, including Sansas, iRivers, iPods (classic & touch), the Ibiza Rhapsody, etc. But, recent years I’ve been feeling relaxed to one distinct players. Why? Because I was pleased to discover how well-designed and fun to utilize the underappreciated (and widely mocked) Zunes are. If you’re still for the fence: grab your selected earphones, head right down to a Best Buy and have to plug them to a Zune then an iPod to see which one sounds better for your requirements, and which interface allows you to smile more. Then you’ll know which can be right for you. Thankfulness to my father who told me on the topic of this blog, this blog Keels and Wheels, May 2014 | CarReads.com is truly amazing. firm arguments and describing everything regarding that. Hands down, Apple’s app store wins using a mile. It’s a plethora of all sorts of apps vs a very sad number of a handful for Zune. Microsoft has plans, particularly the arena of games, but I’m not sure I’d need to bet about the future if it aspect is essential to you. The iPod is often a much better choice therefore. Hi it’s me Fiona, I am also visiting this website Keels and Wheels, May 2014 | CarReads.com daily, this site is truly nice and the visitors are genuinely sharing pleasant thoughts. Hi there everyone, it my first pay a visit at this website, and post Keels and Wheels, May 2014 | CarReads.com is really fruitful for me, keep up posting these types of articles or reviews. Wow, good Keels and Wheels, May 2014 | CarReads.com Thanks keep it up. Hello to every , because I am actually eager of reading this Keels and Wheels, May 2014 | CarReads.com web site post to be updated regularly. It contains good data. The Zune is targeted on being a Portable Media Player. Not a browser. Not a game machine. Maybe in the foreseeable future it’ll do better still in those areas, for now it’s a easy way organize and focus on your music and videos, and is also without peer in that way. The iPod’s strengths are its web browsing and apps. If those sound more compelling, perhaps it can be your best option. Zune and iPod: Most people compare the Zune to the Touch, but having seen how slim and surprisingly small , light it really is, I think it over to be a very unique hybrid that combines qualities of the two Touch plus the Nano. It’s very colorful and lovely OLED screen is slightly smaller compared to touch screen, however the player itself feels considerably smaller and lighter. It weighs about 2/3 the maximum amount of, and is also noticeably smaller in width and height, while being merely a hair thicker. This is certainly pretty logical stage as heightened within your web log. Treasure looking at close to. Hello there! I could have sworn I’ve visited this website before but after going through a few of the posts I realized it’s new to me. Regardless, I’m certainly delighted I came across it and I’ll be book-marking it and checking back frequently! Awesome! Its really amazing Keels and Wheels, May 2014 | CarReads.com , I have got much clear idea regarding from this post. Sharing some thing is better than keeping up-to our self, thus Keels and Wheels, May 2014 | CarReads.com the YouTube video that is posted at this juncture I am going to share by means of my family and friends. it, you will be a great author. I will be sure to bookmark your blog and will often come back someday. Hi there would you mind stating which blog platform you’re using? I’m going to start my own blog in the near future but I’m having a hard time deciding between BlogEngine/Wordpress/B2evolution and Drupal. The reason I ask is because your design seems different then most blogs and I’m looking for something unique. P.S My apologies for getting off-topic but I had to ask! Hi I am from Australia, this time I am viewing this cooking related video at this Keels and Wheels, May 2014 | CarReads.com , I am really delighted and learning more from it. Thanks for sharing. I think the admin of this Keels and Wheels, May 2014 | CarReads.com is in fact working hard in support of his web page, for the reason that here every stuff is quality based data. This Keels and Wheels, May 2014 | CarReads.com will assist the internet people for setting up new webpage or even a weblog from start to end. I am genuinely thankful to the owner of this site Keels and Wheels, May 2014 | CarReads.com who has shared this fantastic paragraph at here. Hurrah, what a quality it is! As mostly YouTube video lessons have no nice feature, however this Keels and Wheels, May 2014 | CarReads.com is truly a good quality video. Hey there! I’ve been following your website for some time now and finally got the bravery to go ahead and give you a shout out from Kingwood Tx! I’m amazed, I have to admit. Seldom do I come across a blog that’s equally educative and interesting, and let me tell you, you have hit the nail within the head. The problem is something not enough men and women are speaking intelligently about. I am very happy that I stumbled across this during my search for something concerning this. I all the time used to read article Keels and Wheels, May 2014 | CarReads.com in news papers but now as I am a user of internet thus from now I am using net for articles or reviews, thanks to web. Hi, its good post Keels and Wheels, May 2014 | CarReads.com concerning media print, we all know media is a fantastic source of facts. Keels and Wheels, May 2014 | CarReads.com Stunning quest there. What happened after? Take care! No one can deny from the feature of this video posted at this web page Keels and Wheels, May 2014 | CarReads.com , pleasant work, keep it all the time. It my first go to see to this web site Keels and Wheels, May 2014 | CarReads.com , and I am truly amazed to see such a pleasant quality YouTube video posted here. This video post Keels and Wheels, May 2014 | CarReads.com is in fact enormous, the sound feature and the picture quality of this video post is in fact awesome. I am truly delighted to glance at this webpage posts which Keels and Wheels, May 2014 | CarReads.com contains lots of helpful facts, thanks for providing such data. You need to be a part of a contest for one of the finest websites on the net. I’m going to recommend this web site! It very simple to find out any matter on net as compared to textbooks, as I fount this article Keels and Wheels, May 2014 | CarReads.com at this site. Really when someone doesn’t know afterward its up to other viewers that they will help, so here it occurs Keels and Wheels, May 2014 | CarReads.com . That hits the target pefltcery. Thanks! Very good info. Lucky me I ran across your site by chance (stumbleupon). I have book marked it for later! Oh my goodness! Amazing article dude! Thanks, However I am going through issues with your RSS. I donâ€™t understand why I am unable to join it. Is there anyone else having identical RSS issues? Anyone that knows the answer will you kindly respond? Thanks!! An interesting discussion is definitely worth comment. I believe that you should publish more about this topic, it might not be a taboo subject but usually people don’t speak about these topics. To the next! Many thanks!! Spot on with this write-up, I seriously feel this web site needs far more attention. Iâ€™ll probably be back again to see more, thanks for the information! This page certainly has all of the info I wanted about this subject and didnâ€™t know who to ask. I blog quite often and I truly thank you for your content. Your article has really peaked my interest. I’m going to book mark your website and keep checking for new information about once a week. I subscribed to your Feed as well. about my difficulty. You are amazing! Thank you! I blog often and I seriously thank you for your information. The article has truly peaked my interest. I will bookmark your website and keep checking for new information about once a week. I subscribed to your RSS feed as well. Spot on with this write-up, I really believe that this web site needs a great deal more attention. I’ll probably be returning to read through more, thanks for the information! An outstanding share! I’ve just forwarded this onto a coworker who had been conducting a little research on this. And he actually ordered me dinner simply because I stumbled upon it for him… lol. So let me reword this…. Thanks for the meal!! But yeah, thanx for spending some time to talk about this issue here on your website. You have made some really good points there. I checked on the internet for more information about the issue and found most people will go along with your views on this web site. Good site you have here.. Itâ€™s difficult to find high-quality writing like yours nowadays. I truly appreciate individuals like you! Take care!! Oh my goodness! Impressive article dude! Many thanks, However I am experiencing difficulties with your RSS. I don’t understand why I can’t subscribe to it. Is there anybody having the same RSS issues? Anyone that knows the answer will you kindly respond? Thanx!! Good post. I learn something totally new and challenging on websites I stumbleupon everyday. It will always be useful to read content from other writers and use something from their web sites. Hi there, I think your web site may be having browser compatibility problems. When I take a look at your web site in Safari, it looks fine however, when opening in IE, it’s got some overlapping issues. I merely wanted to provide you with a quick heads up! Other than that, wonderful site! Your style is so unique in comparison to other people I’ve read stuff from. I appreciate you for posting when you’ve got the opportunity, Guess I will just bookmark this blog. You are so cool! I do not believe I’ve truly read anything like that before. So nice to find someone with some genuine thoughts on this issue. Really.. thank you for starting this up. This website is one thing that is needed on the web, someone with a little originality! Incredible, it’s a ideal section of create which I have go through while in in length period of time. Execute in addition take a look at my new site. After going over a few of the blog articles on your site, I seriously appreciate your way of writing a blog. I added it to my bookmark webpage list and will be checking back soon. Please check out my website as well and tell me your opinion. Greetings! Very helpful advice in this particular article! It’s the little changes which will make the most important changes. Thanks a lot for sharing! Thanks a lot for sharing this with all people you really understand what you’re talking approximately! Bookmarked. Please also visit my site =). We can have a link trade contract among us! An impressive share! I’ve just forwarded this onto a coworker who had been doing a little homework on this. And he in fact bought me lunch simply because I found it for him… lol. So let me reword this…. Thanks for the meal!! But yeah, thanx for spending some time to talk about this topic here on your web site. Your style is very unique in comparison to other people I have read stuff from. Thanks for posting when you have the opportunity, Guess I’ll just book mark this web site. Hello there, I found your site by means of Google even as searching for a related topic, your web site got here up, it appears good. Can I simply say what a relief to uncover an individual who genuinely understands what they are talking about on the internet. You definitely realize how to bring an issue to light and make it important. More people must look at this and understand this side of the story. I was surprised that you are not more popular given that you most certainly have the gift. I think the admin of this website is in fact working hard in favor of his web page, since here every stuff is quality based stuff. I seriously love your blog.. Excellent colors & theme. Did you create this website yourself? Please reply back as I’m looking to create my own site and would love to know where you got this from or what the theme is named. Thank you! Good info. Lucky me I ran across your blog by chance (stumbleupon). I have book marked it for later! I’ve read some good stuff here. Definitely worth bookmarking for revisiting. I surprise how so much effort you put to create the sort of wonderful informative website.